Alright folks, this post is getting real. I have not yet found a great spot in my home to take outfit pictures. Our rooms are smallish and multi-purpose, city living at its finest. Also, this is my first time experimenting with my camera remote for outfit pictures. But I persevered. 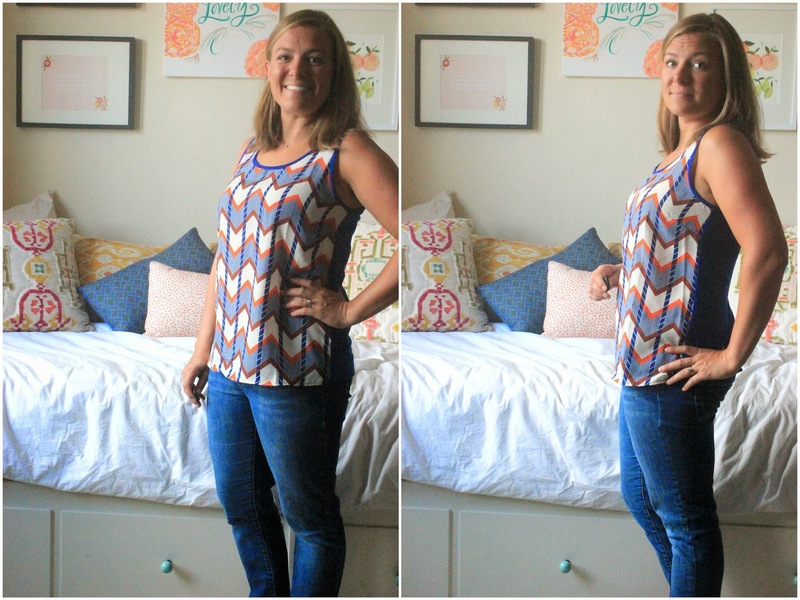 I find that seeing how other people wear items from their stitch fix is incredibly helpful to me and also helped me decide to try the company in the first place, so I wanted to offer this option to you as well. 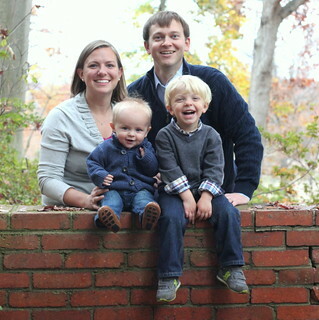 Plus, I need your help deciding what to keep. So here we go...Stitch Fix #12 Give me your feedback. 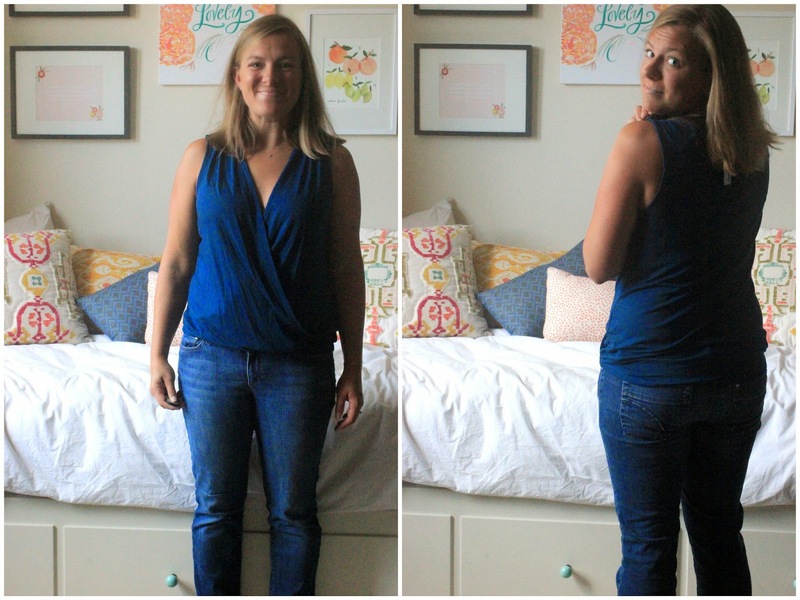 These are the 5 pieces that came in my stitch fix this month. This was my first stitch fix after completing my "contentment challenge" which made it even more exciting, even if sometimes I am making a funny face in the pictures. A few things to note about stitch fix. My goal is to find 1-2 items per month to spruce up my wardrobe. Rarely do I even consider the whole box. With that mindset, this becomes a realistic shopping outlet for me. I try to vie stitch fix as the chance to get outside my comfort zone, so I can add a few pieces in my closet that aren't on everyone else I pass in DC. -- I was skeptical of this top as soon as I saw it. Cross front and elastic waistlines are not a friend of the postpartum body (can I still claim that 16 months out?) Or really, they aren't great for women who are in their child bearing years, eager people jump to conclusions about any resemblance of a bump. But when I tried this on, it was such a flattering neckline, and for my shoulders, arms, it became an immediate contender. What do you think? Does the positive neckline outweigh the not so great waistline? Or is it a pass? -- This was a winner from the start. I loved it out of the box, I asked for something like this in my feedback to my stylist, and I love that it will take me throughout the year since it is easy to layer. Not to mention I love everything blue (and Behr's favorite colors are blue and orange). I love this top so much, I didn't even bother to get good pictures in it since I knew it was a keeper. -- I love Tart, but this shirt wasn't doing it for me. My first thought when putting it on was, "this would be great for when I volunteer at Behr's school!" But then I realized, I have plenty of shirts that fit in that category. What I am really looking for are items I feel fantastic in for date nights, dinner with friends, wearing on days I have to stop by the office. I am not sure this top fits the bill. What do you think? -- This was the surprise of the box. 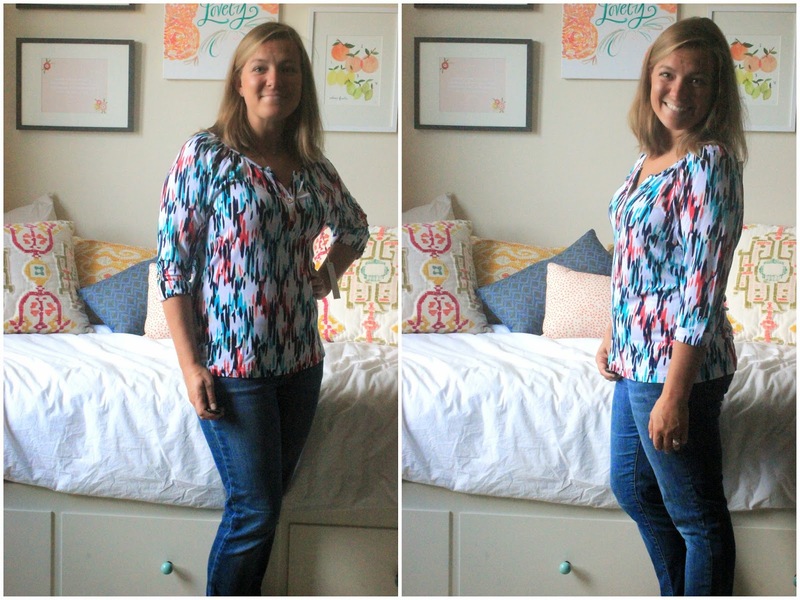 I was thrown off by the shape of this top, but the fabric was great, the colors work well for me (blue, of course) and the shape was more flattering than I had guessed. But the back keeps throwing me off. I'm not sure I like how the chevron panel widens in the back. Yay or nay? -- I love this maxi skirt. I love the tulip shape in the front, the front slit makes it easy to move in. But, I have two maxi skirts that I never wear. I feel to short for this trend. Also, I never know how to style a maxi skirt, which might be why I never wear mine... Give me your thoughts. Okay, that is it, my 5 items. Which are your favorites? And do you have any other questions about stitch fix? I would love to hear what you have to say. Feel free to also give me all your tips on camera remotes and taking outfit pictures. Clearly I need some improvement here. You look pretty and tan!! 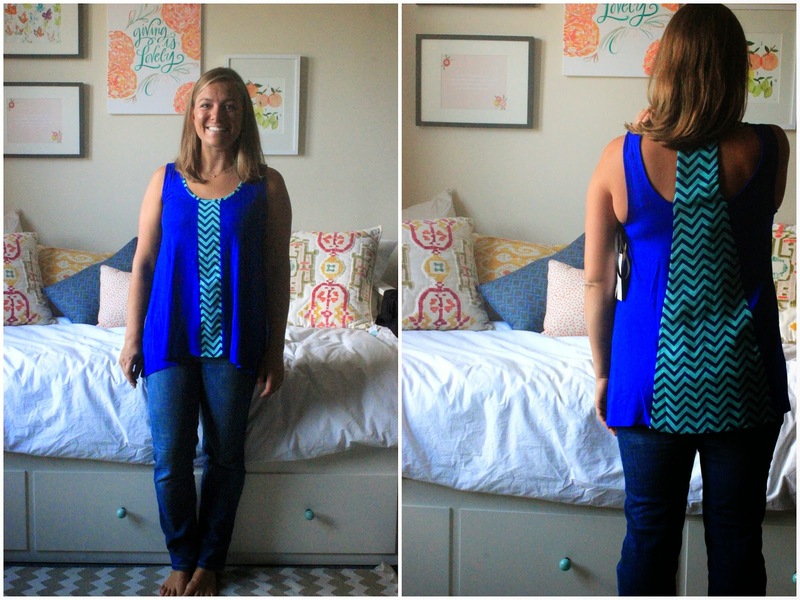 Love #2 the chevron top! I would say No to three and four, and probably No for #1. You're right, the neckline is great! (And from the pics the waist is not that bad!) But at this point I want to hold our clothes (yours and mine) to a very high standard and only keep if it's great and completely works for you (or me). :) Wish I was there to try these on. 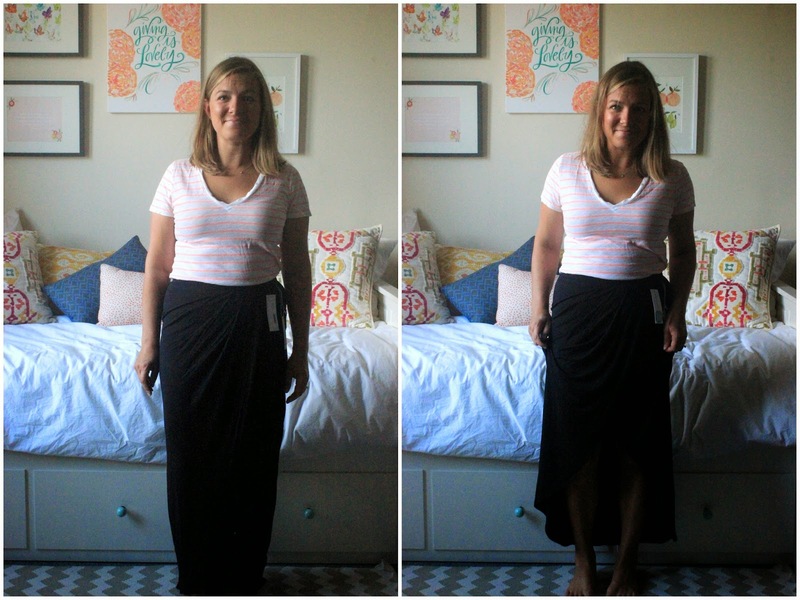 Torn about the maxi skirt. If you don't wear the other two, would you think about selling/giving away those and trying this one? Is this one better than the others? Top #2 makes the whole thing worth it. So fun. Love number 2 and 4. Especially number 4--I think that is my favorite out of all of them. The others are a no. and I vote yes, you can still count as having a postpartum body--your hormones aren't even back to normal until 18 months out! I say No. 2 and No. 4! I think No. 4 looks AMAZING on you; the color and the shape is just perfect.